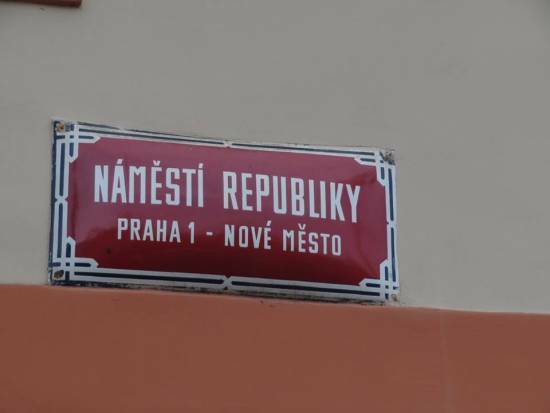 The area around the square called náměstí Republiky marks the start of the old Royal Route that leads all the way to Prague Castle. A tower that marks the division of Old Town from New Town still stands there. Just outside the Powder Tower, on the New Town side, there are several ghosts: two separate riders of three-legged horses and a cursed miller with a carriage. 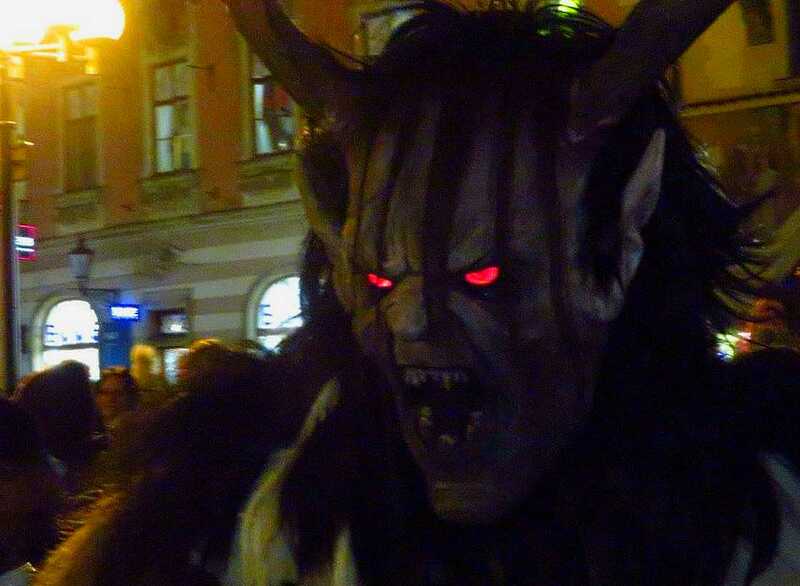 One of the scariest ghosts in Prague is also the most mysterious. A headless knight appears on a black three-legged stallion, and they ride like the wind around the square, with sparks flying from the horse’s hooves, similar to those seen from a blacksmith’s anvil. And just as suddenly as they appear, they vanish. These wounds seem not to be the work of an angry rival in love, but more like results from fierce battle. But what war, and what side he fought on is unknown. Without a head, he cannot ever tell his tale, and with so few clues there is no way to know how to help release him from his fate. He tends to ride in front of a shopping mall on the square that is in a building that used to be a barracks. The barracks opened in the late 18th century, which is a little late for knights in armor, so the mystery remains. 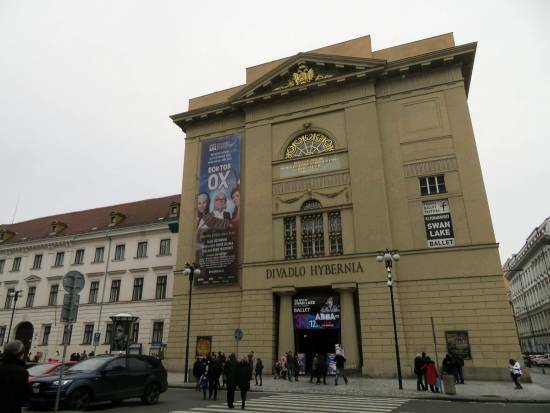 Another dominant feature of the square is the Hybernia Theater (Divadlo Hybernia). It is a former college and monastery that was run by Irish Franciscans from 1629, during the Thirty Years’ War, to 1786, when Emperor Joseph II abolished it with his sweeping religious reforms. The massive structure was long abandoned. A phantom known as the Black Spaniard used to emerge from the former monastery every night, riding an old and shabby three-legged nag who limps along at a slow pace. 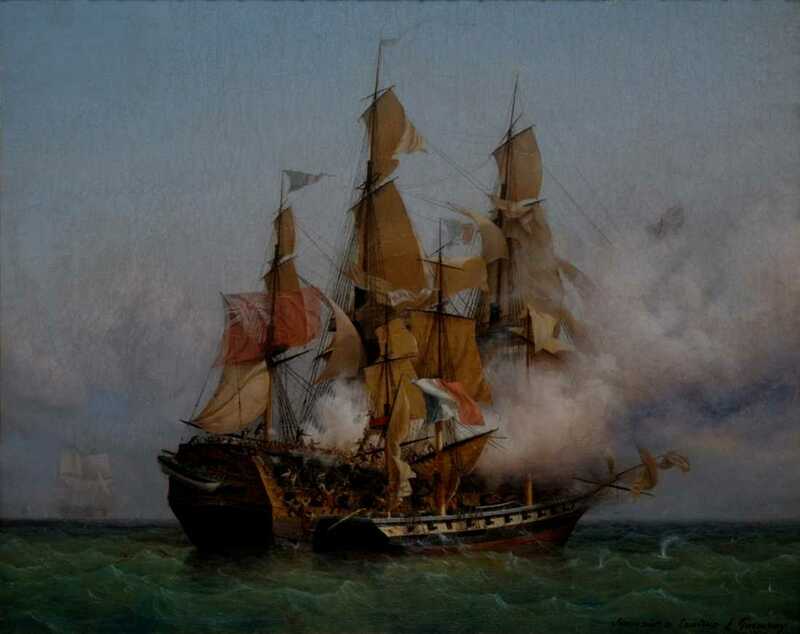 The Spaniard’s face has one eye and a pointy chin. He wears a patched plaid coat and wide-brimmed hat, with his hair pulled back around the nape of his neck. He seems to have been a soldier at some time who fell down on his luck. 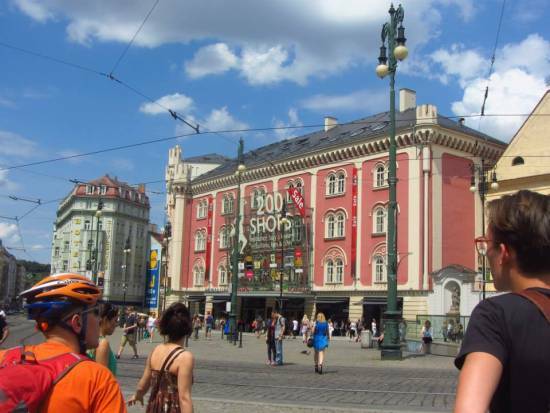 After the building was fully renovated and reopened recently as a theater, he has not been seen. Perhaps the well-dressed crowds of theatergoers made him self-conscious of his scruffy appearance. Like his faster headless counterpart, his origin is a mystery. The final ghost on the square used to be a spectacular sight, but is seldom seen these days. 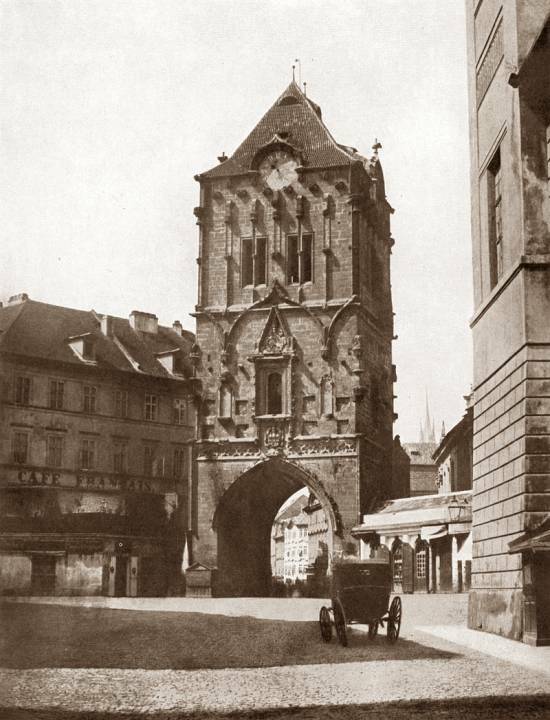 A miller drives his horse-drawn cart from the Vltava river down Celetná Street and through the Powder Gate. 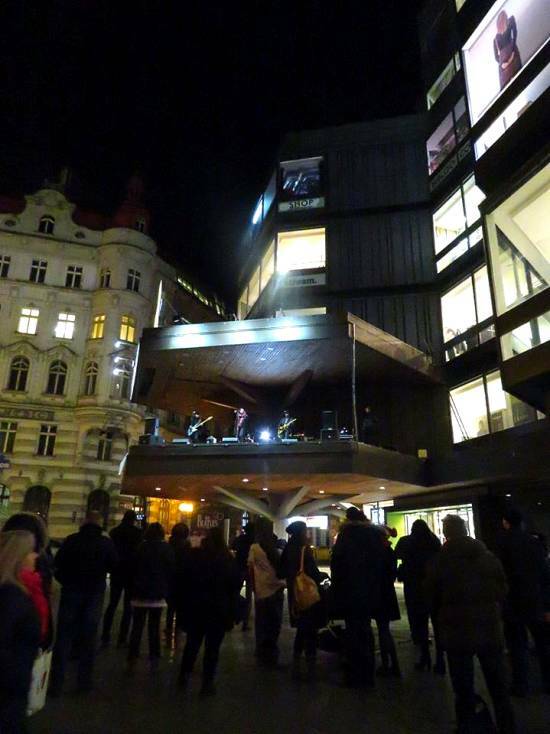 As soon as he reaches the edge of náměstí Republiky at Na Příkopě at midnight, the sidewalk opens up. Flames shoot out from the horses’ nostrils, and the reins turn into venomous snakes. The earth rumbles with loud noises. The miller cannot stop his cart, and it goes into the open pit with its horses and driver. The earth quickly seals up as if nothing happened, leaving people to question what they saw. He has not appeared in many years, though. The city has become too modern and touristy for him, and the route is so full of people, even at night, that is is hard to navigate. The rather similar tales of riders on three-legged horses likely began as one tale, but which is the original is hard to say. After the Thirty Years’ War, Bohemia had close ties to Catholic Spain, which was also under the sway of the Habsburgs. The famed Infant of Prague, still on display at the Church of Our Lady Victorious, is supposed to have originated in Spain, and was given to the church by Princess Polyxena of Lobkowicz, who advocated strong ties between the countries. A Spanish knight figures into one of the tales associated with the House at the Golden Well. Millers also figure into several Czech ghost legends, such as one about a miller’s daughter who wanted to marry above her class and another about a miller who ate turkey on a religious fast day. The turkey returns as a flaming ghost in front of the former mill. Both these tales take place on Kampa island, which has a stream with disused mill wheels. Ghosts with horses or carts are very popular in Prague, and there is even a cart drawn by ghostly goats on Kozi Street. The Czech word for goat is “kozel.” The last of the pagan royalty, Drahomira, was sucked down to hell in her carriage, and small stone circle on the street marks where it happened. Náměstí Republiky, or Republic Square, dates back to the founding of New Town by emperor Charles IV in 1348. 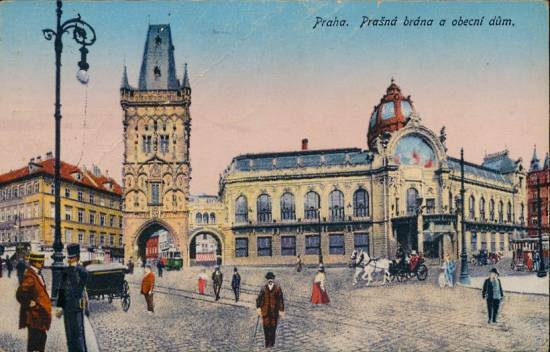 It has had several names including náměstí Františka Josefa I., Hybernské náměstí, Kapucínské náměstí and Josefské náměstí. 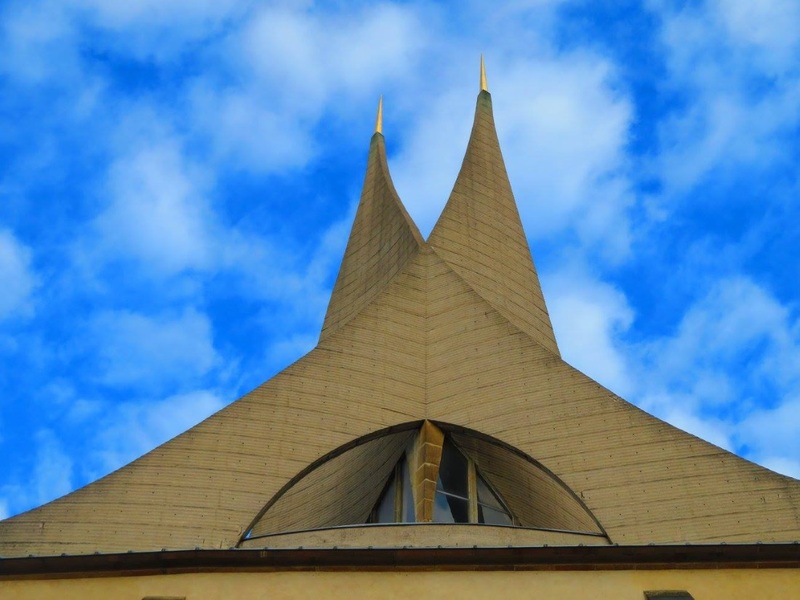 It has been called by its current name since the founding of Czechoslovakia in 1918, except for a brief time during World War II when it was Hybernské náměstí. The Irish Franciscan monastery gives the place the name Hybernia, a variation of the Latin word for Ireland. 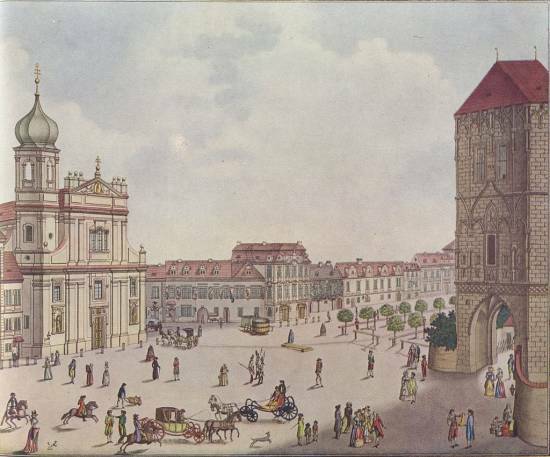 The monastery opened in 1629 as a sort of Irish Catholic outpost and had a turbulent history until Emperor Joseph II closed many urban churches and monasteries in the mid-1780s. Around the same time he banned urban cemeteries for health reasons. These two actions laid the seeds for several ghost stories, with displaced ghosts searching for their former homes, a vengeful hair-covered man protecting former sacred ground, and clergy including a Templar knight and an invisible nun appearing near the converted buildings of former church property. The Irish Franciscans wound up in Prague after being banished by Queen Elizabeth I from their homeland. 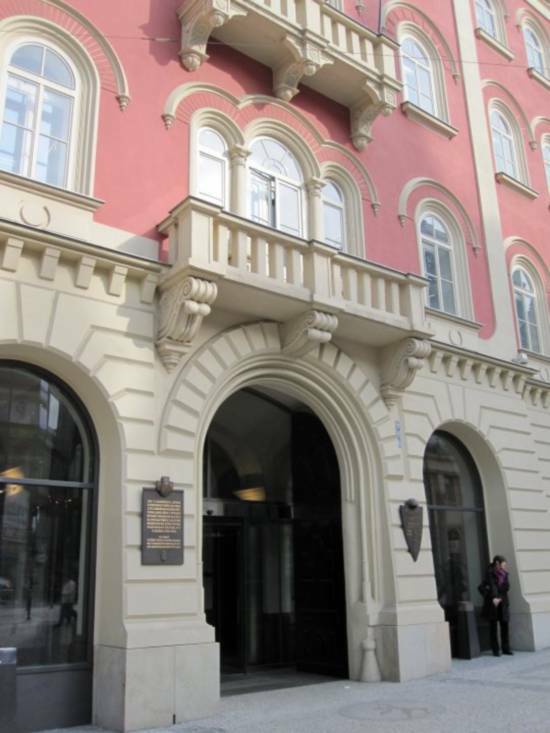 They established the College of the Immaculate Conception of the Virgin Mary at what is now Divadlo Hybernia. The main building was originally in the Baroque style and has been remodeled into the rather heavy and imposing Empire style structure that exists today. After sitting in a dilapidated state for decades, it reopened as a modern theater in 2006. The barracks on the square opened in 1795 as the Joseph Barracks (Josefské kasárny) and were renamed the George of Poděbrady Barracks (Kasárny Jiřího z Poděbrad) in 1919 after the end of Habsburg rule. It was closed officially in 1993 and sold off. After an extensive renovation including an archaeological survey, it opened as a shopping mall called Palladium in 2007. The survey showed the square was occupied as early as the 12th century with stone and wooden buildings. Later there were kilns on the site. A medieval gold ring was also found. The far end of náměstí Republiky has another shopping mall, the modern Kotva building, built in a hexagonal pattern in the 1970s. 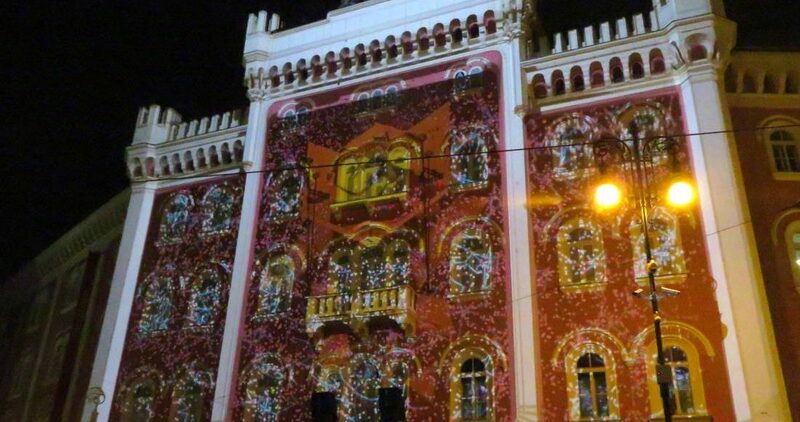 Another important building on the square is the Municipal House (Obecní dům), notable not only for its rich Art Nouveau decor, but also for its historical significance as the place where Czechoslovak independence was proclaimed in 1918. It was built between 1905 and 1912 on the site of the former Royal Palace, which had been unused since the 15th century and was in ruins. The Powder Tower is one of the last remaining medieval gates in the city, built in 1475 and used for storing gunpowder. Its current look is from a heavy-handed renovation in the late 19th century. 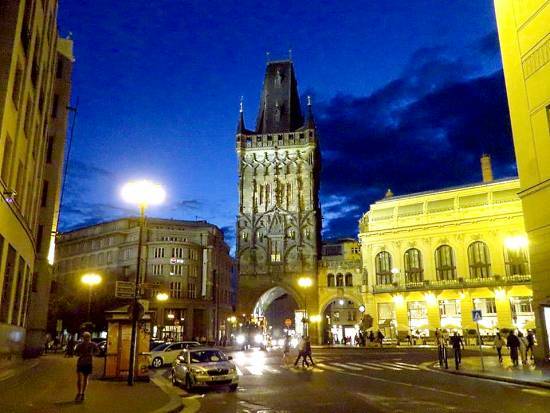 The Royal Route leads from the Powder Tower down Celetná Street to Old Town Square, then down Karlova Street, across Charles Bridge and up Nerudova Street to Prague Castle. The Emperor card in the Major Arcana of The Tarot of Prague uses a figure of a king from the facade of the Powder Gate. 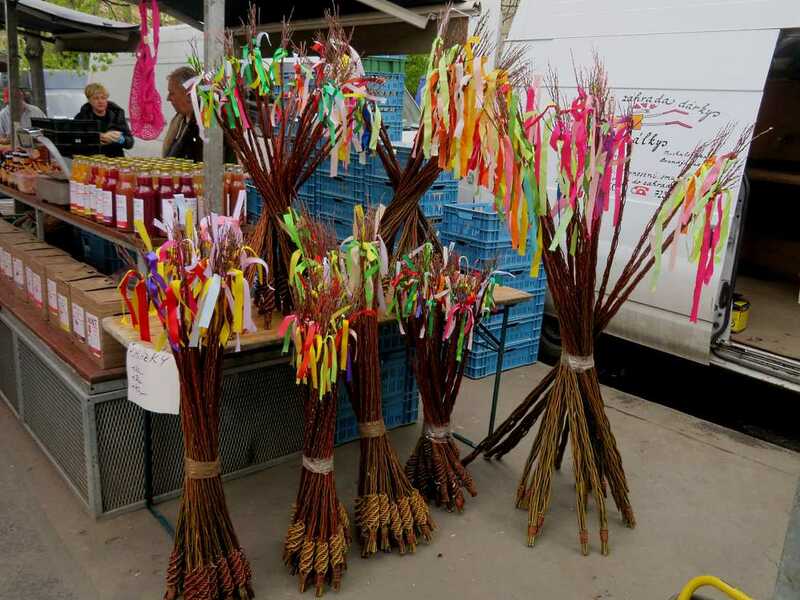 An image from Obecní dům can be found on the Empress card.